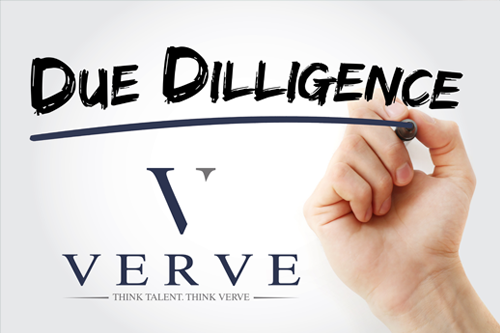 M&A Due Diligence - VERVE Professional Services, Inc.
Providing due diligence requires real-world, practical, and tactical experience. VERVE has developed a comprehensive road map to guide clients through the M&A process. VERVE helps clients examine the potential financial, fiscal, legal, operational, and administrative issues involved with any transaction. Additionally, VERVE’s human resources expertise identifies human capital risks, including management team and key employee compensation, pension risks, high employee turnover, difficult labor relations, local regulations and importantly, cultural risk. Distinguishing between management consultants and transaction advisors is important. Large companies often manage their own acquisition efforts and then hire transaction advisors such as investment bankers, attorneys, and tax specialists who offer technical assistance until the deal is complete. Unfortunately, these experts often overlook the problems of post-merger integration. From a post-integration perspective, this is where the real management and leadership challenges begin. VERVE tracks merger integration initiatives and assesses and attempts to correct dysfunctional behaviors by refining existing integration plans, performing integration audits, team-building initiatives, and coaching of senior and middle management into the post-merger company culture. VERVE’s comprehensive analysis offers practical insights and solutions to help clients prepare for negotiations and lay a solid groundwork for closing and integration, but, more importantly, VERVE’s analysis helps clients after the deal happens.